As discussed in our earlier article Emmet Livestyle is an essential tool for web developers to speed up CSS coding. 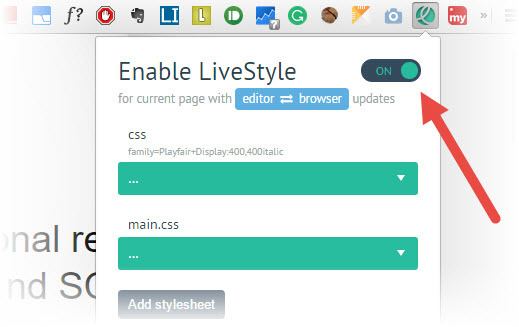 Emmet Livestyle is a bi-directional real-time edit tool for CSS, LESS and SCSS. It will automatically update your CSS stylesheet when you make changes in Chrome and vice versa. Emmet Livestyle plugin is now available for Atom editor along with the Sublime Text. Here is how to get started with Emmet LiveStyle for Atom editor. Emmet LiveStyle not working? We have also discussed about how to fix Emmet LiveStyle if it is not working for you. That’s all, run the Emmet Livestyle app from your desktop and enable livestyle from the Chrome. Now make changes to your CSS in Google Chrome and see your stylesheet which updates automatically. LiveStyle not working? Not updating the stylesheet? Here is a fix. Restart the LiveStyle App and it should be working now.